Directions to VA's scariest haunted house! Come to the Haunted Barn from Virginia Beach, Newport News, Hampton Roads, Chesapeake, Windsor, Isle of Wight, Smithfield or other areas of Virginia! Like us on Facebook for previews, pictures, updates and discounts! 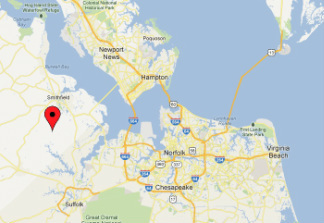 Located at 19251 Bob White Road, Windsor, Virginia 23487. The actual barn is off of Reuter Lane (You will see a sign for Merry Oaks Stables). To find us, follow the directions below or use the address above in your GPS. Take I-95 S toward Petersburg. Take the US-460-BR E / County Dr exit, EXIT 50, toward Norfolk. Merge onto I-664 N/Hampton Roads Belt toward US-13/Bowers Hill/US-58/Suffolk/US-460/Newport News. Merge onto US-13 S/US-58 W/US-460 W via EXIT 13A toward Suffolk. Merge onto Pruden Blvd/US-460 W toward Petersburg. Turn right onto Lake Prince Dr/VA-604. Turn right onto Orbit Rd/VA-600/VA-637/VA-605. Continue to follow Orbit Rd/VA-600/VA-637. Turn slight right onto Woodland Dr/VA-600. Take the 1st left onto Bob White Rd. Turn left onto Carroll Bridge Rd. Turn right onto Bob White Rd.